The prosecution of allegedly corrupt politicians has been the topic of political debates for the past three years, and it intensified in recent weeks with the release of the Bond Commission report which implicates some senior politicians. President Maithripala Sirisena on Thursday, addressing an election campaign rally of the Sri Lanka Freedom Party (SLFP) in Kosgama, took it to another level said some reports were questioning when or whether he would quit office as he had promised. He said he would ensure that the corrupt politicians would be sent to prison from whatever party and then to hell before he quit office. This prompted many on social media to question if President Sirisena is planning to stay on in office ‘forever’ given the snail’s pace at which the prosecution of corrupt politicians has proceeded during the past three years he has held office. Amid an uproar in India over the release of the film “Padmavati”, now renamed “Padmavat” to appease the detractors of the movie, Prime Minister Ranil Wickremesinghe has welcomed the screening of the film in Colombo. A PM’s office official said that the PM had met the distributor of the film recently and made inquiries about the delay in screening the movie here. He had said that there were no protests in Sri Lanka over the movie and if the Censor Board cleared it, the film could be screened.The movie got the go head from India’s Supreme Court this week and is likely to hit the local cinemas here on January 25. Based on the epic poem Padmavat (1540) by Malik Muhammad Jayasi, the film narrates the story of Padmavati, a legendary Rajput queen who committed jauhar (self-immolation) to protect herself from Khilji, a ruthless Muslim king. Padmavati also known as Padmini was the daughter of a king named Gandharvsen, the king of Singhal (Sinhala).While there is no historical record in Sri Lanka about a king by that name, the poem tells the story of an Indian king who sails the seven seas to woo a princess renowned for her beauty and takes her back to his kingdom. We often hear of people’s houses getting burgled and thieves getting away with money and jewellery. What is seldom heard of is the stealing of trees planted in home gardens. This was the case in a house located opposite the Netherlands Embassy in Colombo 07, an area with a high measure of security. In the garden was a highly valued sandalwood tree. A few days ago, when the residents woke up in the morning, they were astonished to find the sandalwood tree had been neatly cut at the base and taken away. Shocked by the incident, the family members had complained to the Cinnamon Gardens Police. The police checked the CCTV cameras in the area and found a vehicle making rounds in the vicinity in the dead of the night. Police are conducting investigations but are yet to make any arrest. Some candidates contesting at the upcoming local councils elections are being introduced in humorous ways. Given that the elections are related to local issues and the candidates have been drawn from among close knit communities, the candidates are being introduced through posters that underline their connections to the local community. One candidate has been identified as the “grass-cutting sister” or Thanakola Kapana Akka, another as the “daughter of tall Piyadasa aiya who lives near the sluice gates” and another as “Batti”. This is because these candidates are better known by their pet names rather than by their formal names. The Ilankai Thamil Arasu Katchi (ITAK), one of the main partners in the Tamil National Alliance (TNA) opened its election office in Palugamam across the Batticaloa Lagoon. Several candidates, MPs and former MPs spoke at the event. Suddenly from amidst the crowd someone shouted, “Elephants are coming, elephants are coming.” The crowd and those on the stage became agitated, because elephants (the four-legged variety) usually roam the area. But it turned out to be two-legged elephants – United National Party candidates contesting the local polls and their supporters. 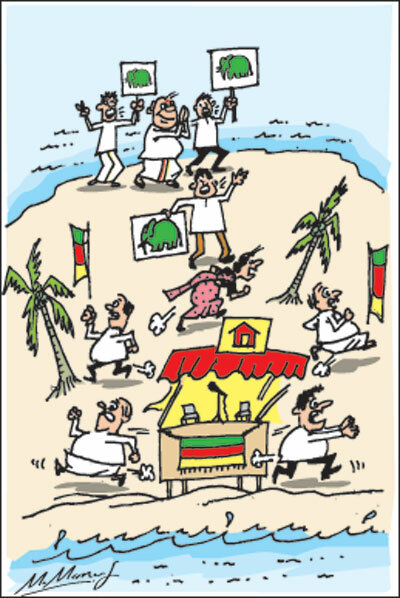 Election Commission Chairman Mahinda Deshapriya is much in the news and these days he is extra busy trying to teach voters how to mark the ballot papers correctly. At a news conference this week, after a lengthy explanation, a scribe asked him to explain the procedure all over again. An exasperated Mr. Deshapriya realised that his efforts had been in vain and suggested that the scribe watch the short film that has been made explaining in detail how to vote under the new electoral system. Jaffna’s Hindu College celebrated Thai Pongal on a large scale with several cultural events conducted along the streets as part of the festivities. There were plenty of colours and also plenty of police security. In the festivities were a group of students clad in attire that resembled Tigers (the four-legged variety). Police were perturbed, but the festivities continued amid some humorous remarks about the Tigers. The tiger dance or puliyattam is part of Tamil culture. The Election Commission has largely been quite strict when enforcing election laws during the ongoing local government polls campaign. On many occasions, officials have taken prompt action when complaints were made that candidates or supporters were violating election laws. Some unfortunate candidates, however, are finding that things they had taken for granted during their day-to-day lives also are being reported as violation of election laws. One such incident has been reported from Nuwara Eliya. A veteran candidate from a prominent Tamil political party in the estate sector is also the trustee of several kovils in his electorate. With or without elections, he visits the kovils to worship and for administrative matters. The trustee, however, was in for a shock recently when during a visit to one of the kovils, he was met by police officers who told him that there had been a complaint that his visit to the kovil was part of his strategy of canvassing votes. The local Assistant Commissioner of Elections was also soon on the phone, telling the candidate that he could no longer make such visits. The candidate, whose temper got the better of him despite being in a house of worship, did not mince words when he asked whether being a candidate meant he could not worship his gods.